Option 1 Prize Package (Yamaha): Every Yamaha is designed to help make your dream for outdoor adventure REAL – by delivering superior off-road capability, comfort and confidence for performance that is proven. The Yamaha Viking EPS with its true three-passenger interior cabin and class leading wheelbase, provides a smooth and quiet ride. This 700-class engine is ready to conquer whatever comes its way with a powerful 686cc, liquid-cooled, fuel injected, SOHC power plant. Industry-exclusive three-position On-Command® 4WD system lets you quickly dial between 2WD and fully locked differential 4WD. The rear cargo bed is made of steel and is designed for a heft load capacity of 600 pounds. 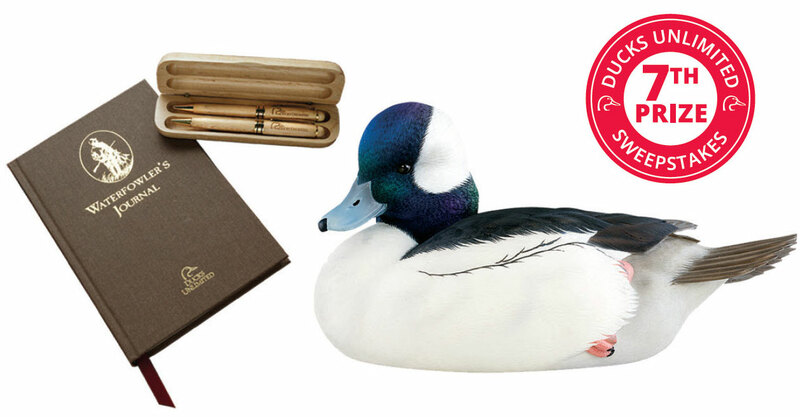 Be ready for duck season with this complete waterfowl hunting package. 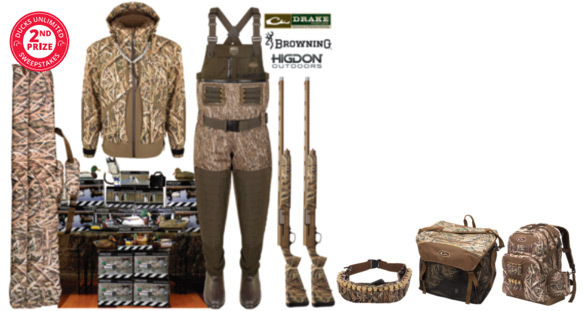 This package includes: Drake Guardian Elite™ 3-n-1 Systems Jacket, Guardian Elite™ 6-Layer 4-n-1 Chest Wader with Tear Away Liner, 2 Gun Cases, Swamp Sole™ Backpack, Wader Bag 2.0, & Neoprene Shell Belt (2) Browning A5 Wicked Wing MOSGB 12 Gauge Shotguns. 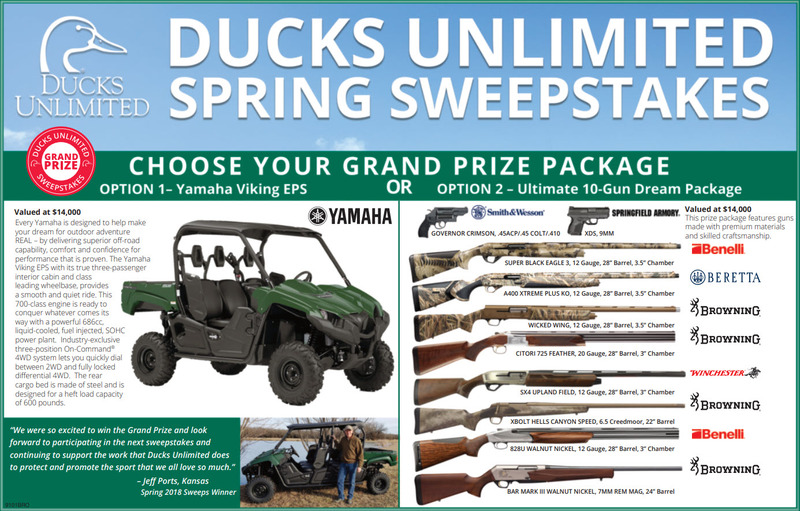 This prize also includes a huge Higdon Decoy package with a variety of versatile duck decoys & premium motion products for all your hunting needs. Kimber builds the finest handguns that this world has ever seen right here in America. 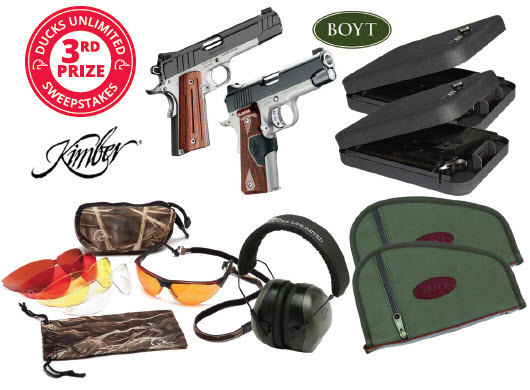 Included in this package (1) Kimber Custom Carry II Handgun, (1) Kimber Custom Aegis II 9MM 5" Handgun, (2) Boyt Pistol Rugs, (2) Boyt Vault Cases for safekeeping and (2) Shooting Protection Kits. The PM80 Series Earmuffs feature soft foam ear cups, and a fold-away, padded headband and a noise Reduction Rating of 26dB. The Shooting Glasses feature a ventilated, adjustable nose piece, ratcheting lens pitch adjustment and five interchangeable H2X anti-fog lenses in clear, amber, sunblock bronze, orange and vermillion. From the truck to the game or the cabin without breaking a sweat, the Tailgater Bronze Grill packs a full-size punch. It weighs only 62 pounds and comes with EZ-Fold Legs for max portability. Now you can grill, smoke, bake, roast, braise, and BBQ wherever and whenever you please. 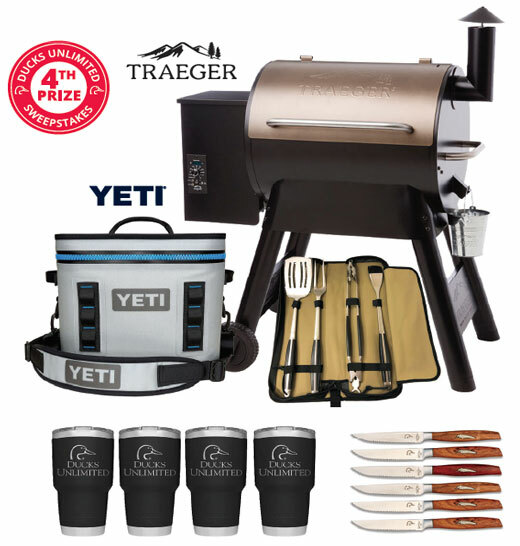 Also included in this package is a DU BBQ set, (4) DU 30oz Yeti Tumblers, (1) Yeti Soft-sided cooler and (6) DU top-quality steak knives. This prize package includes the BX-3 Mojave 10X42mm Roof Binoculars with fully Multi-coated lenses and L-Coat BAK4 prisms for a very bright image with extremely accurate color reproduction. You will also receive a VX-3i 4.5-14X10mm scope. This scope features the Twilight Max Light Management System DiamondCoat 2™ external lens coatings for scratch resistance and a dual spring precision adjustment system. Also featured in this prize is a DU Leather & Waxed Canvas Backpack. In "Our Heritage", Anthony J. Padgett, former DU International Artist of the Year, captures the essence of family, respect for nature, and the importance of wetlands conservation in this endearing scene. Make this canvas truly yours with personalization options on the truck door and choosing your favorite sporting dog in the foreground. Made in the U.S.A. Measures 25 1/2" x 35 1/2." Also included in this package is the new DU Plaid Blanket featuring super soft microfleece on the front and Sherpa on the reverse side. Measures 50"x 60". Full size Bufflehead Decoy by Master Carver Jett Brunet. Jett is one of the most decorated carvers in history; winning the world championship twice so far. This full-size cast resin decoy, with felt-covered bottom features an inlaid Ducks Unlimited medallion and signature by Jett Brunet. Also included is a heirloom quality journal and DU wooden pen & pencil set and case. The 9x6 journal features parchment pages for logging information such as weather conditions, flight times, location, hunters, number of birds seen and decoyed. This four-piece fixed blade collection highlights the North American waterfowl flyways. The knife handles are created from genuine ebony wood and inlaid with a unique carved nickel feather. 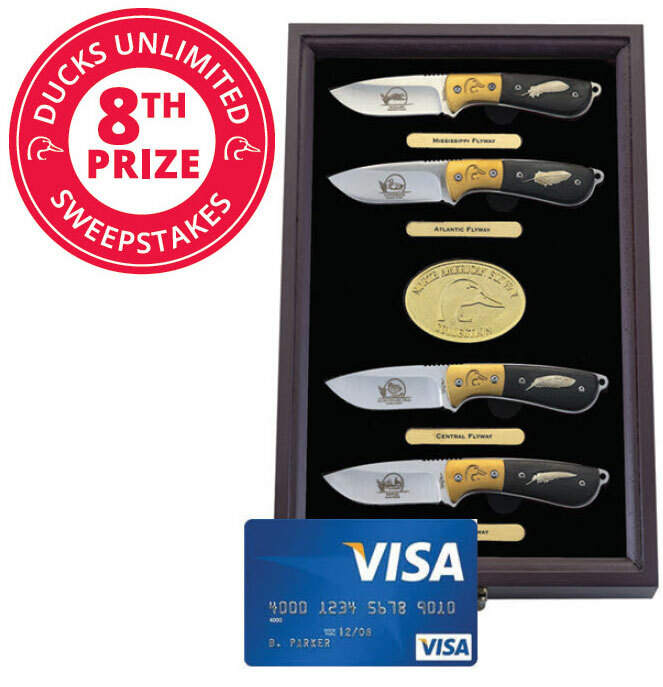 Each knife features a different duck species laser etched on the stainless- steel blade. The DU logo is laser etched on the brass finger guard. The set comes in a felt lined wooden display case. You will also receive in this prize package a $100 Visa Gift Card. 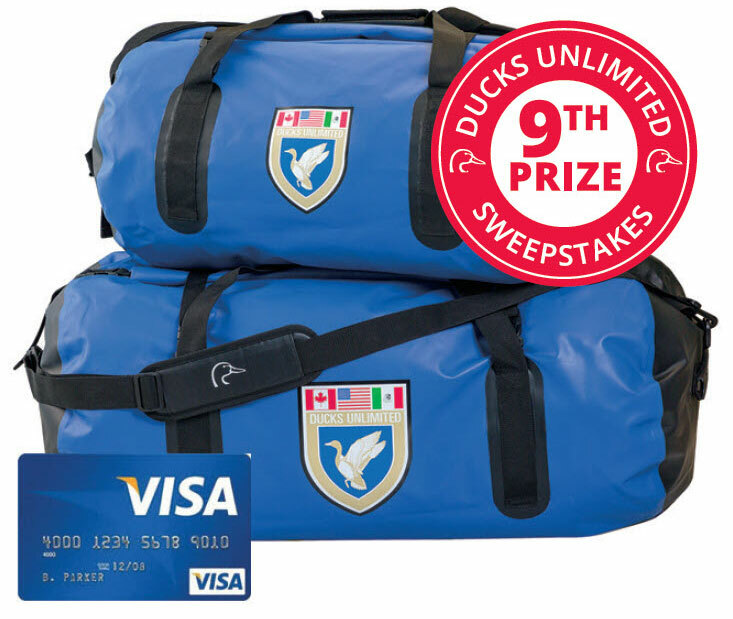 The two royal blue waterproof bags feature the Ducks Unlimited Crest logo. Each bag includes a roll-down top with quick release buckles, padded removable shoulder strap, side haul handles, compression straps, and back mesh pocket. You will also receive in this prize package a $100 Visa Gift Card. Etched with the Ducks Unlimited Crest, this 3-piece set features an elegant cut glass decanter and a pair of whiskey glasses. The decanter features a glass stopper and holds 23 ounces of liquid. The glasses are fashioned with a thick, weighted glass base and will hold 12 ounces. 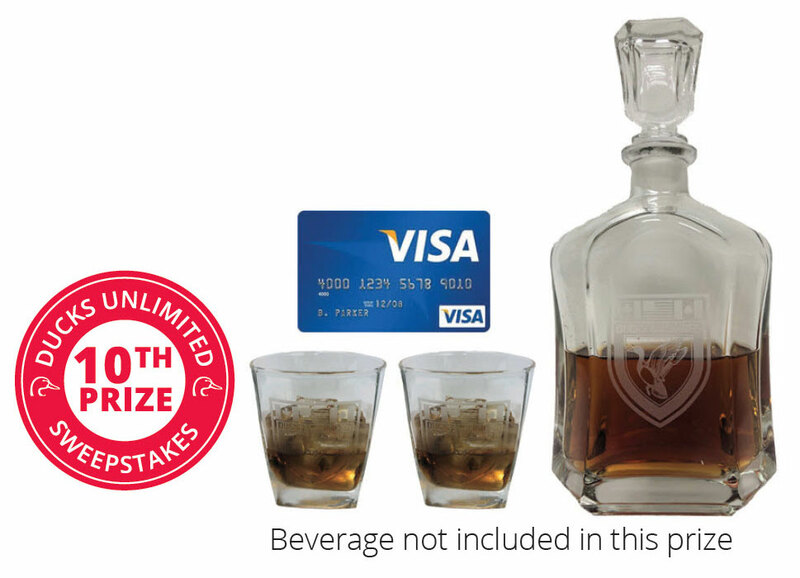 You will also receive in this prize package a $100 Visa Gift Card.